"And watch out — he might have got those rifles"
Before the dogs can reach Charles, the crack of a rifle shot is heard, and the dog pack flees. 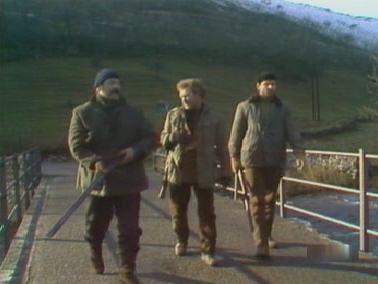 Unaware that Charles is hiding beneath their feet, Sanders, Jim and Phil cross the bridge and agree the next phase of their search for the 'rabid' fugitive. 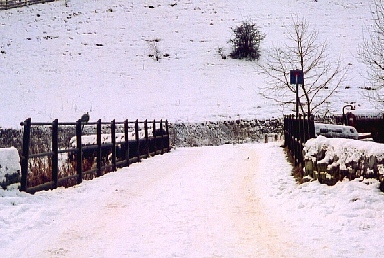 Description: The bridge beneath which Charles hides is located right in the heart of the Monsal valley, near the only crossroads junction. Where is it? : The road which runs down from the junction, between Dean Cottage (Fenton's house) on one side and Upperdale Farm (Jim and Sanders' place) on the other, leads over the bridge and to the far bank. 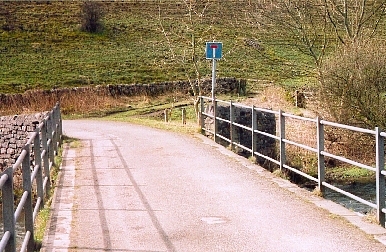 The bridge can also be reached from the top of the Monsal viaduct, by following a short section of the 'Monsal Trail' (the path that leads along the viaduct top) away from the sealed tunnel entrance. Follow the path until it passes the site of the old Monsal Railway station (a spot now marked by an unattractive brick shed). Immediately behind the shed, pass through the gap between the wall and the gate. Turn right onto a rocky stone track (signposted for Upperdale) and walk downhill, underneath another bridgeway, to arrive at the bridge from the opposite riverbank. Where's the best vantage point? : The shot is filmed from on top of the bridge, with the crossroads at the rear, as Sanders' team walk towards the camera. What about access? : The bridge is part of the public highway, and so is fully accessible (although a watch must be kept for occasional vehicles). Anything else? : As with all the Monsal sites, numerous other locations are nearby — including the road along which Charles cycles, and the house from where he steals the bike. As with the viaduct top, the bridge itself is a popular tourist spot, and can be a very busy area at "peak times". During quieter periods it is a stunningly beautiful and restful setting.